"Magnificent...absolutely wonderful piece of Theatre..."
"JACK held this committed [York] theatre crowd captive…the music soars." JACK premiered at the Goodspeed Opera House’s Norma Terris Theater in Connecticut. And when the lights went up that night, virtually the entire audience was was in tears. The show received a second production, featuring Broadway performers in the lead roles, at the University of Oklahoma, and another at the Olympia Theatre in Dublin, Ireland. 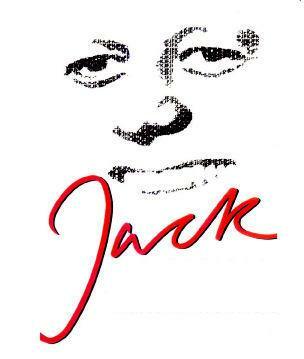 JACK was recently showcased -- to much praise -- at Manhattan's York Theatre. It is one week since Dallas. We are welcomed by a saddened but resolute Jackie Kennedy, determined to guide us through John F. Kennedy's story, to make certain it is told truly, before the historians "get it wrong." Beginning with Jack’s days at Harvard, circa 1937, through his assassination, JACK dramatizes – in song and movement – his life, growth, his bonds with siblings, his mother, Rose, and her father, while focusing on the central conflict in his life – Jack’s fight to become his own man despite a difficult, painfully ambivalent relationship with his powerful, obsessed father. Here, at its core, JACK deals with the young man’s reactions, his life-choices resulting from Joseph P. Kennedy, Sr.’s pressures on him, from birth, to play second fiddle to his firstborn brother, Joe, Jr. who, their father had ordained, was to become the first Catholic President of the U.S.
From the family’s time in Europe while his father served as FDR’s ambassador to the UK, on through Jack’s military service, we see the older man’s often ruthless interference in his second son’s life in order to prevent possible embarrassment to Joe, Jr. And then, following Jack's headlined WWII heroism in the Pacific, and Joe, Jr.’s tragic death during a bombing mission for which he volunteered in order to top his brother, their devastated father’s ironic demand that Jack take Joe’s place by entering politics. JACK chronicles John F. Kennedy’s initially reluctant decision to run for Congress, his time in Washington and his growing passion to make America better, while resisting his father’s ongoing attempts to control him. From Jack’s romance with Jacqueline Bouvier, their marital difficulties due to his philandering, on through his successful campaign for the Presidency, JACK conveys the magic of their presence, the idealism he shared with his younger brother, Bobby, how it – and they – dazzled, and began to change this Country in positive ways. And all the while the father’s links with the forces of darkness cast longer and longer shadows. Until they, combined with Jack’s crossing of lines, among them the Bay of Pigs, Civil Rights, his and Bobby's violation of their father's pledge to the Mob that his boys wouldn't go after them, and ultimately, Jack's decision to begin our withdrawal from Vietnam, finally resulted in his murder. An event that continues to resonate for all of us, marking as it did not just the end of Camelot, but the beginning of the end of much, much more.